Wisconsin Film & Bag (WFB) was founded in 1972 by John Rupple Sr. Operating out of a small plant in Oconto, Wisconsin, WFB was a manufacturer of plastic trash bags. Since its beginning, WFB has experienced continued growth and accomplished numerous milestones. WFB moved to a new 20,000 sq. ft. plant in Shawano, Wisconsin increasing its capacity to 6.5 million pounds. 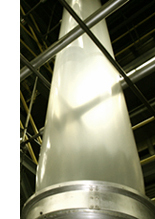 Two additional extrusion lines were added expanding capacity to 10 million pounds. WFB was purchased by two equity funds and Jack Riopelle joined the company as its new president. Seven new extrusion lines were added expanding capacity to 45 million pounds. Plant expansion projects increased the square footage from 20,000 to 60,000 square feet. Installed the first EREMA repelletizer for the purpose of recycling internally generated film scrap. Implemented an interactive, integrated manufacturing system complete with MRPII, ERP and shop floor data collection. Jack Riopelle retired as president and Jim Feeney was appointed as his successor.